We have just returned from a week’s tour around Sri Lanka. 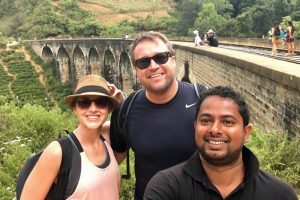 We were lucky to have Chaminda as our driver and would strongly recommend him. He was completely professional, a safe and considerate driver and well liked by the whole family. His knowledge of the routes meant he could recommend things to see and do as well as make arrangements for us. Our room was Negombo – Kandy – Nuwara Eliya – Udawalawe – Mirissa – Galle – Balapitya – Colombo. There were so many highlights it is difficult to list them all. My husband and I had spent part of our honeymoon in Sri Lanka over 30 years ago. We were so please to discover that it was as beautiful as we remembered but the travelling and accommodation rather more comfortable nowadays! See more information and photos of See Sri Lanka Tours or Send Message. Drivers can use this link to tell us the name of the driver. It will be added to the review -Send Message to Admin.